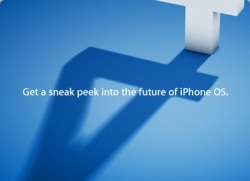 iPhone OS 4.0 Revealed Today! BLUETOOTH KEYBOARDS. In a October 2008 post, I wrote: “Only once Apple takes my advice (Ha!) and creates a iPhone-compatible keyboard will I really be able to leave my laptop behind…“. Perhaps that time has come! Multitasking! iPhone users have been waiting for this one for quite a while. Now, I can use other apps while listening to Pandora, etc. Folders to group app – which I had been doing anyway by grouping like apps in separate pages. But this will certainly save time and make it easier to navigate. Also, for app addicts, this means being able to have 2160 apps instead of the current possibility of 180. A better mail app! The ability to read by thread and to have more than one exchange account linked to a particular iPhone! Check out the full live coverage from Gizmodo and engadget.